Among the bad ideas floating around Washington to stimulate the lagging economy is a proposal that would boost the federal government's matching payments to the states for Medicaid. Our colleague Bob Helms of the American Enterprise Institute has done excellent original research on the flaws with "the FMAP" — Federal Medical Assistance Percentage. The Federal government provides money to the states to "match" their Medicaid expenditures. But it has become mostly a way for rich states to game the system at the expense of poor states. How this is supposed to help the economy is beyond me. Richer states, like New York, get a lower federal match — 50% — and poorer states, like Mississippi, get a much higher federal matching payment — 76%. Sounds fair. But when all is said and done, the great majority of federal money actually goes to the richer states. Nine states, led by New York and California, got half of all federal Medicaid money in 2005, Helms finds. The reason: They can afford to boost their Medicaid spending to "buy" the federal matching dollars. Poorer states can't. Further, raising the FMAP is just a back-door way of boosting entitlement spending, doing little to contribute to real economic growth or create new private-sector jobs. This is a bad idea that should be scratched off the list of options for the economic stimulus package. To put my tax hat on for the moment, there is a lot of evidence that the economy is suffering from poor monetary policy and from crushing regulation of the financial services sector, especially Sarbanes-Oxley. Most importantly, anticipation that the Bush tax cuts will expire in 2010 would result in one of the biggest tax hikes in American history and already is cooling economic activity. Instead of fixing these problems, Congress is contemplating throwing money at artificial plans, including a $500 one-time rebate check to consumers. As The Wall Street Journal says, "We are supposed to believe it is 'stimulating' to take money from one pocket and hand it to another." The impact of marginal tax rates that change incentives for people to work, save, and invest is the driving force in our economy and should be the focus of Congress. Members should cut marginal income tax rates, reduce corporate tax rates, eliminate the alternative minimum tax, and make the Bush tax cuts permanent. The economy would soar in anticipation of this real economic growth package. 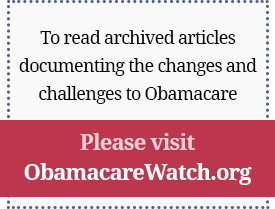 This is an excerpt from the January 18, 2008 edition of our Health Policy Matters newsletter.